With High Speed HDMI support for high-definition video up to 1080p (1920x1200), IOGEAR's combines HD and USB technology. HDCP compliant, the switch can be used in home entertainment centers where multiple HDMI inputs and USB-based accessories are used. In addition to USB peripherals and HDMI video, the switch supports analog audio (via 3.5mm jacks) and includes a USB port to attach USB peripherals, such as a printer, hard drive, card reader or hub. 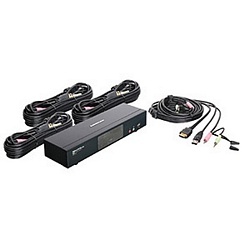 Includes 2 HDMI/USB/audio cables, PS/2 to USB converter, firmware upgrade cable and AC adapter. Requires HDMI display, USB keyboard/mouse, and source devices with HDMI-out.